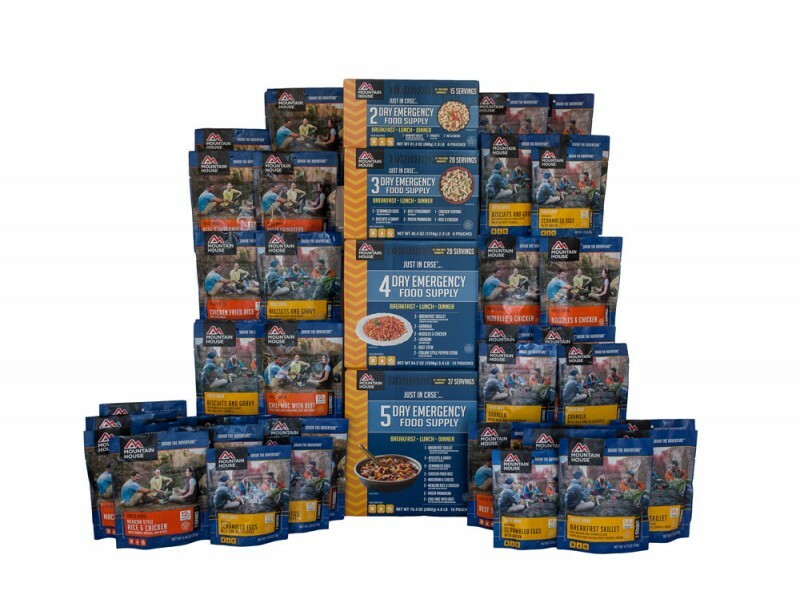 This stackable 14-day boxed kit contains a variety of popular breakfast, lunch and dinner entrees for one person. Made to be compact and easy to store, this kit measures less than 19” x 12” x 16”. 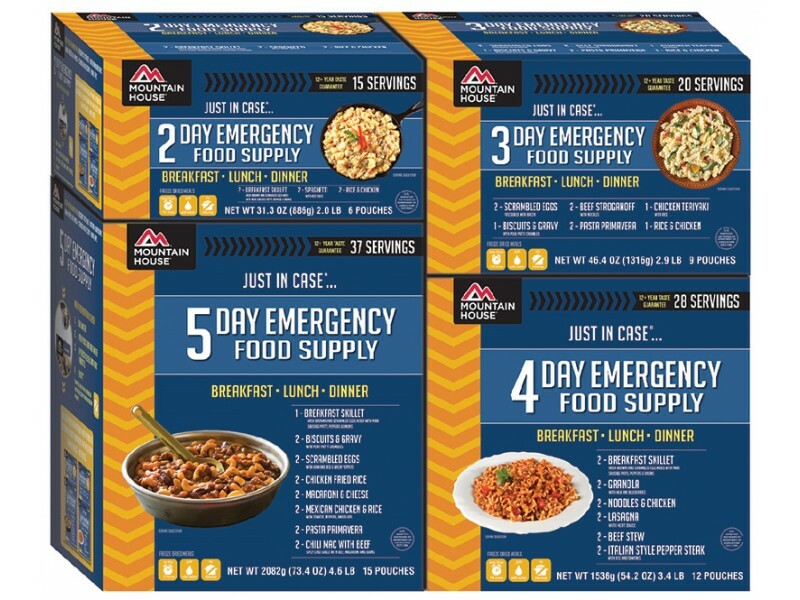 Now you can easily customize an emergency food supply with Mountain House Just in Case…® Emergency Food Supply Multi-Day Kits. 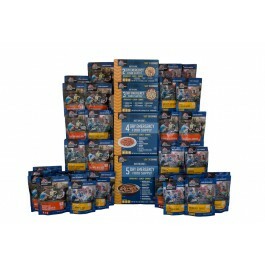 This stackable 14-day boxed kit contains a variety of popular breakfast, lunch and dinner entrees for one person. Made to be compact and easy to store, this kit measures less than 19” x 12” x 16”. •5-Breakfast Skillet: Hash browns and scrambled eggs mixed with pork sausage, peppers & onions. Each pouch makes two 1-cup servings. •3-Biscuits & Gravy: Hot fluffy buttermilk biscuits with creamy pork sausage gravy make for a hearty, family-favorite. Each pouch makes 2 1-cup servings. •2-Eggs & Bacon: The comforting taste and smell of crispy, crumbly bacon combined with scrambled eggs. Each pouch makes 1.5 1-cup servings. •2-Granola with Milk & Blueberries: Perfect with hot or cold water, our Granola and Blueberries has fueled everyone from United States Special Forces to explorers on Antarctic expeditions, and everywhere in between. Made with crunchy sweet granola with real blueberries and milk. Prepared hot or cold, it is a great way to start any day. Each pouch contains 2 ½-cup servings. •4-Pasta Primavera: Zucchini, spiral macaroni, cauliflower, broccoli, red & yellow peppers and green beans in a creamy, parmesan cheese sauce. Each pouch makes 2.5 1-cup servings. •3-Rice & Chicken: Rice and chicken in a savory sauce accented with pimentos makes for a delicious meal anytime, anywhere. Each pouch makes 3 1-cup servings. •2-Beef Stew: Made with tender dices of all natural beef, potatoes, peas, and carrots. A long-time Mountain House classic. Each pouch makes 2.5 1-cup servings. •2-Beef Stroganoff: Tender beef, noodles, and mushrooms smothered in a rich sour cream sauce. One of our most popular meals! Each pouch makes 2.5 1-cup servings. •2-Chicken Fried Rice: Made with long grain rice, chicken, scrambled eggs, chopped onions, savory mushrooms, green peas, red peppers and diced carrots. Each pouch makes 2.5 1-cup servings. •2-Chili Mac with Beef: Spicy chili sauce with real beef, macaroni noodles, onions, and beans. Each pouch makes 2.5 1-cup servings. •2-Lasagna with Meat Sauce: Pasta with chees in a rich tomato meat sauce. A favorite Italian style entrée. Each pouch makes 2.5 1 ¼-cup servings. •2-Macaroni & Cheese: Classic comfort food. Macaroni noodles in a smooth, creamy, and very cheesy sauce. Each pouch makes 3 1 ¼-cup servings. 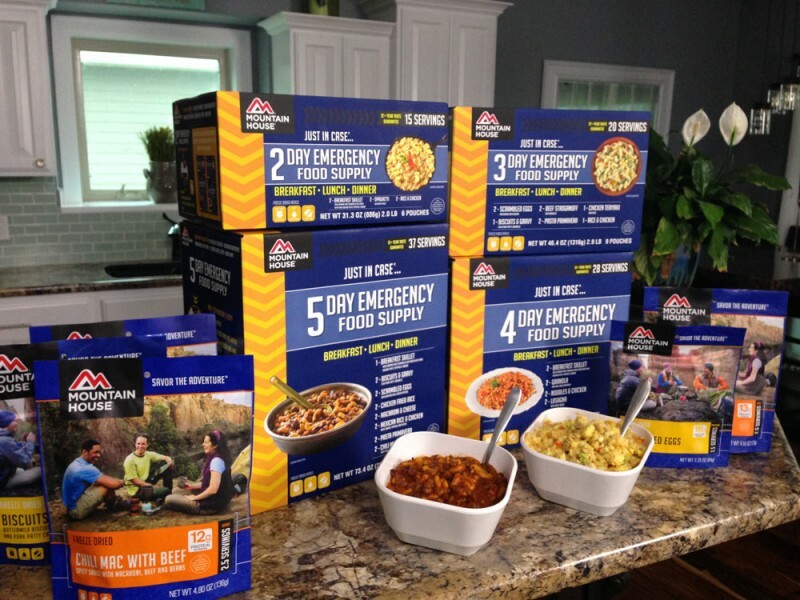 •2-Mexican Rice & Chicken: Spicy rice, beans, and chicken seasoned with tomato, peppers and olives. A quick and easy dinner with a kick. Each pouch contains 3 1-cup servings. •2-Noodles & Chicken: A rich and creamy sauce with pasta, red peppers, and pieces of real chicken meat. Each pouch makes 2.5 1-cup servings. •2-Italian Style Pepper Steak with Rice & Tomatoes: Tender cuts of steak with red, green and yellow bell peppers, onions and tomatoes with long grain rice. Each pouch makes 2.5 1-cup servings. •1-Chicken Teriyaki: Chicken, rice, mushrooms, bamboo shoots and vegetables with a sweet and tangy oriental sauce. 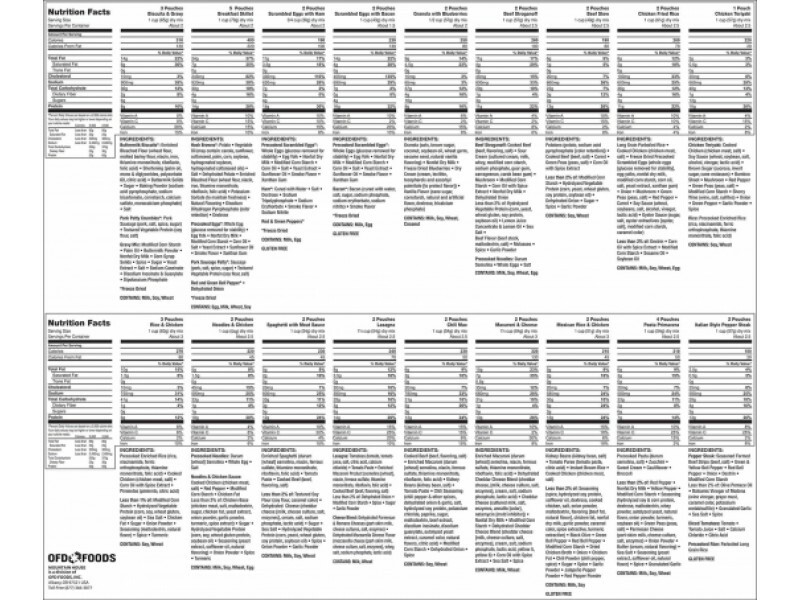 Contains 2.5 1-cup servings.